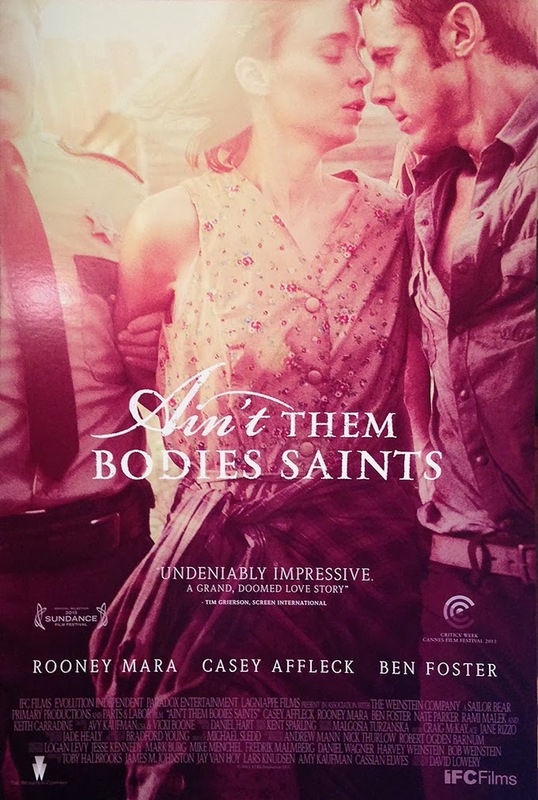 I have nothing against Ain't Them Bodies Saints save for one thing. It tries too hard. 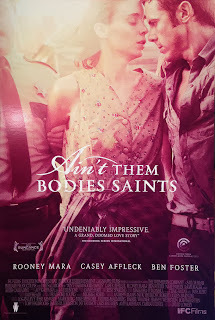 If it were not for the performances of the three leads, Ain't Them Bodies Saints would probably be insufferably artsy. Fortunately, we see that those in front of the camera can do great things with material that is too self-conscious of its 'art'. Bob Muldoon (Casey Affleck) and Ruth Guthrie (Rooney Mara) are deeply in love, but they are in the Bonnie and Clyde school of love. They are criminals, but soft-spoken ones. 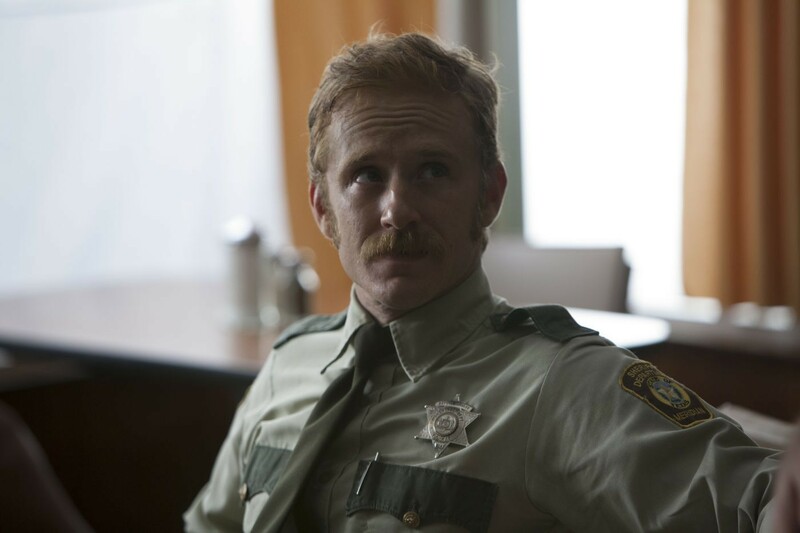 They are caught in a shack, and in the ensuing firefight Ruth wounds a deputy sheriff, Patrick Wheeler (Ben Foster). Ruth is expecting a child, and Bob takes the fall for her act. He is sentenced to 25 years in prison, and Ruth gives birth to their daughter. If memory serves correct about five to seven years pass by. Bob is still in prison, with his dreams of Ruth and their child. Ruth, however, has taken that time to build up a life of her own, and in an odd turn, become friendly with Patrick. Bob and Ruth's father figure Skerritt (Keith Carradine) keeps a wary eye on Ruth, especially now that Patrick tells her that Bob has busted out. He is determined to see Ruth and his child, and Ain't Them Bodies Saints follows the chase for Bob and the relationship between Ruth and Patrick. Skerritt warns Bob off but he will not be dissuaded. Bob's desire for Ruth will cost him dearly, and the fates of Ruth and Patrick left unknown. I think what pushed Ain't Them Bodies Saints down a bit for me is the fact that writer/director David Lowery drowns us in beautiful, poetic imagery that the lushness soon takes precedence over everything else. The film is quite beautiful-looking, that is for certain. However, what is questionable is Lowery's decision to have everyone speak in almost hushed tones. It makes things seem far too self-conscious about it being unreal, and for myself, I found that something that keeps me at arm's length from the characters. It's as if even the characters know they are not real, just shadows on which to represent ideas, not actual beings. However, within the film itself I see the performances that showcase genuine actors lifting material that while not terrible is a bit too artsy. Ben Foster has had a poor run in film. His turn as Angel in X-Men: The Last Stand was to be his breakout into big time stardom. It failed in so many ways, and Foster has floundered in things like The Mechanic. I certainly hope that Foster is given more character parts that showcase his talent, because he was the standout in Ain't Them Bodies Saints. Against the persona of a gruff, angry, even dangerous person, his Patrick is rather kind and gentle, with a moral core that is protective of everyone. This is a side of Foster we rarely see, and it shows his range and should serve as a calling card to all casting agents to get them to put him in more films. Casey Affleck shows that he is the actor in the family (while his older brother Ben shows he's the director). He is compelling as Bob, someone whom you believe would risk so much for the woman and child he yearns for, but who is also selfish and immature. Mara continues to add to an impressive CV with her quiet Ruth, a woman who grows and understands that, as great a passion she has for Bob, her daughter comes first, and that perhaps Patrick may be a better choice. That subplot of Patrick and Ruth's relationship is something that is a bit puzzling. It does seem a stretch to think Patrick wouldn't have known that Bob and Ruth were the ones who shot him. If he did, it does seem even stranger that he would start a relationship with the girlfriend/baby mama of the guy he thinks shot him. That, as well as what appears to be a gang after Bob, do seem to be there because there had to be some kind of obstacle in Bob's quest to get to Ruth and his child. I'll be frank: the soft, quiet, artsy take on the subject matter left me nodding off from time to time. This I think is what Ain't Them Bodies Saints gets wrong. The story calls for there to be some action, some motivation, something other than quiet stillness. It can be quite irritating and sleep-inducing to where it almost drowns in its efforts in its artistry. However, Affleck, Mara, and especially Foster show their true acting talent and make Ain't Them Bodies Saints watchable, if not strictly enjoyable.